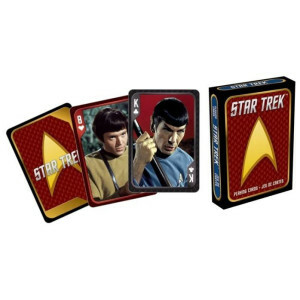 Check out these cards and other Star Trek toys at the Star Trek shop today. These Star Trek cards will take your game where no man has gone before. Purchased as a gift. They loved them and said they were good quality. I really like this playing card set for the most part. I was hoping that more creatures, monsters, characters, and such were including on the cards. All the main bridge characters were included but not much of the for mentioned. I bought these for myself and a gift for a playing card collector's collection. I don't think either of us will ever use them for playing. They have nice pictures on them, but could use more action. They are a bit boring. Nice quality cards - I purchased 2 of these . One to be party favors which I putindividual cards in favor bags for keepsakes from a themed event...the other I bought as a gift which the birthday boy loved them! Purchased this as a gift for my brother. He loves it!!! I like this, but I should have bought 2! One just to keep & the other to play with. I like to play "Memory" game with my young grandkids. They know all the characters and enjoy watching shows with me which leads to many interesting questions and discussions. Great intro tool for young minds. With all of the Star Trek characters, I expected more variety of pictures. If they had restricted themselves to consistency (ie all Aces Kirk, all Kings Spock, etc) it would be understandable. But there's random repetition of people. Quality is good. I collect playing cards and these are some of the best ones I have found. I really love how each card has it's own individual picture.